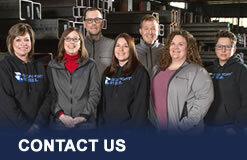 Since 1907, Seaport Steel has been meeting the needs of a variety of industries. Our complete dedication to customer service has proven to be a valuable resource for companies in the Marine, Fabrication, Shoring/Piling, Manufacturing, and Construction industries, just to name a few of the types of customers that depend upon our expertise. Give us a call, we’d love to learn about your business and project needs.